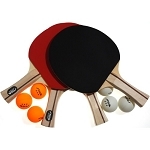 Escalade T814N Table Tennis from Pool Table Conversion Kit on Sale! Convert Your Billiard Table into a Ping Pong Table! Stiga Tennis Tables - T814N Conversion Top Table With Posts and Net. Free shipping for this Stiga conversion table tennis top when shipped to the lower 48 United States. This conversion top table tennis table can change your billiard table into a table tennis table in a flash. The T814N features a 1/2 inch thick premium particle board top with sponge rubber strips to help protect your pool table. Packaging for this product includes a table tennis net and posts so you can start playing immediately. This model is a regulation-size table tennis table. 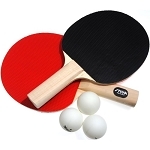 The table top design provides for accurate play as you spike and slam the ping-pong ball around. 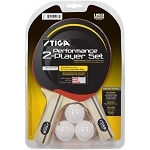 Order Stiga Table Tennis Tables here. Table top material: premium particle board. 3/4 inch black rail for added support. Side strips to help align the tennis table properly. Sponge rubber strips to help protect the conversion top table and the billiard table. Sponge strips also serve to hold the conversion table top in place. Table top dimensions: 108 inches L x 60 inches W.
Fits 7, 8, or 9-foot pool tables. Net and posts included with this table tennis table. Table is shipped via an LTL carrier. Delivery is a curbside delivery, which requires the customer to help the driver unload the products. Shipping package weight: 179 lbs. Shipping package dimensions: 64 inches x 57 inches x 3 inches. Assembled dimensions: 108 inches x 60 inches. Ships from the warehouse in San Diego, California. Typically leaves the warehouse in 3 business days and takes between 3-7 business days in transit depending on proximity to the warehouse. Q: Does this include the Ping-Pong net? Fast Shipping: Orders for the T814N Pool Table to Tennis Table Conversion Kit generally leave the warehouse the next business day. Dimensions: 64" x 57" x 3"